Judy Norbury was born in India in the foothills of the Himalayas and spent her early childhood along the banks of the Holy Ganges River. When Judy contracted polio at the age of four, her parents left India and moved back to Canada. Judy, who uses a wheelchair, was raised on the east side of Vancouver, BC and left the city at the age of 20. She moved to an isolated coastal cabin, was introduced to the Appalachian Mountain dulcimer and began to explore the craft of songwriting. Eventually she moved to the Comox Valley on Vancouver Island where she raised two daughters. On Vancouver Island, Judy soon established herself as a performer. Her imaginative use of language, strong and catchy melodies and easy stage presentation earned her a reputation in the west coast folk music circuit. 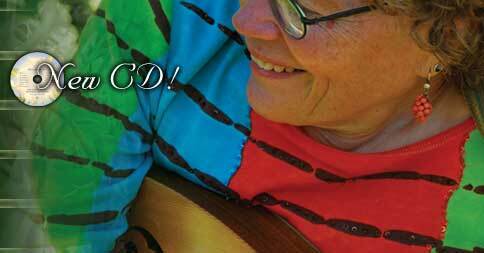 She has played concerts, community events, and folk music festivals throughout British Columbia. Judy has recorded three albums: Gardens of the Moon, Tease For Two with Joanna Finch of Norbury & Finch and a new solo release entitled Did You Find the Door, as well as being part of several compilation recordings. The quiet confidence that Judy has in her own abilities and her expectation to find goodness in other people, are what make her own life stories so inspiring. Her determination and appetite for adventure motivated her to travel to India, the UK, the US, Mexico and Pakistan. She was invited to perform at the Disabled Persons International World Summit in Winnipeg, Manitoba and was a guest speaker at several International Day of the Disabled Person events in Pakistan. Her active lifestyle helps her to identify accessibility challenges and to raise awareness about the needs of disabled persons.